What are the visible and the invisible boundaries between the relationship of oneself and nature? Is it a boundary or a mere disconnect? If so, is it of the physical, mental, emotional, or spiritual? Ushio explores such questions in cultural, historical, mythological, and metaphysical contexts through her artistic practice. 響 (Hibiki) Resonance is derived from a concept sprung from Ushio’s practice of holistic medicine and quantum wave healing. Three large framed works, roughly 4 by 6 feet in size, are comprised from an array of 12 prints, each with what looks to be an infinite ocean of blue dots. Each distinct, the blue dots personify the residuals of the collective particles that make up the essence and interplay of vibrations of the universe. Ravizza Brownfield Gallery is pleased to announce the first kinetic art exhibit in Hawaii; a solo show of works by Alberto Biasi, titled “OP ART” which will open March 2, 2018. Alberto Biasi, born in Padua, Italy in 1937, has always been at the forefront of post-war Italian art. Today he is Internationally recognized as the most coherent and authoritative artist of the genre known as Optical Art (Op Art). The name Op Art itself was coined in 1964 by a TIME magazine journalist who, speaking about a work by Alberto BIasi, then a member of Gruppo N, defined this new art trend as “Optical.” This was shortened into Op Art, a name that summed up new ideas that at the time were being propounded about the perception of art and movement. Kinetic art first appeared after World War II, with its popularity increasing in the 1960s. It was a new language artists were looking for after they felt Lyrical Abstraction had exhausted its possibilities. A new relationship took place between the artwork, the artist, and the viewer. The study of movement became crucial for this new avant-garde, whether real movement with the use of mechanisms, or illusory or optical movement as in the case of the work by Alberto Biasi. Each Op Art work takes careful planning to make it function; using its surrounding light to collaborate with the artwork in a dialogue that is fundamental for the success of kinetic thought. However, it is the viewer who is essential to bringing the work to life. His intervention and interaction with a kinetic work is the basis of the ideas behind this genre, and this puts the artist himself into a secondary role for the work’s total success. These were times when experimental use of materials ran deep in order to play with light in new ways. Alternative materials such as plastic, metal, paper, glass, and mirrors allowed for a search for an aesthetic based on rationality and cyclic movements, and that also exploited the objective perception of each active spectator in front of the artwork. Many exhibitions were held across Europe and the US throughout the 1960s and 70s which were crucial for the development of this genre. In 1965, the Museum of Modern Art in New York City catapulted Op Art’s worldwide interest with its incredibly successful show The Responsive Eye, which had some 180,000 visitors. Biasi along with other Gruppo N members, participated in the 4th annual San Marino Biennale in 1963 where Biasi was awarded first prize. Throughout these exhibits Biasi experimented and delved into what became lifelong research into movement, specifically the passive sense of a purely perceptive motion. The superimpositions of slender ribbon-like structures, laid out according to rigorously calculated geometries, play with the contrasting and varied colors of the canvas to spark off the perception of movement in the viewers eye, who thus become jointly responsible for the visual event that comprises the work as a whole. For the current exhibition, created specifically for Hawaii, Biasi turns to his favorite themes of movement and light, however working in a new, large scale format, as well as playing with transparency and medium. Biasi will travel from Italy to Hawaii to spend three weeks at Ravizza Brownfield Gallery, creating additional art work on site, and will be available for lectures, artist talks, and other teaching programs for both youth and adults. Alberto Biasi’s works can be found in prestigious collections around the world, including the Museum of Modern Art in New York; the Hermitage, Saint Petersburg; the Museum of Modern Art, Rome; the Peggy Guggenheim Collection, Venice; and the museums of Belgrade, Bratislava, Buenos Aires, Prague, San Francisco, Tokyo, Turin, Ulm, Wroclaw, and Zagreb. Ravizza Brownfield Gallery is pleased to bring an intrigue of an artist to an end the 2017 calendar with a fantasy emitting showcase. Andy Warhol’s silkscreen prints such as Shoes from 1980 engage our obsession with his subjects of consumerism in America. On October 20th the Nuuanu Ave opens its doors to the public 6:00 - 8:30 pm. When Honolulu contemporary artist Taiji Terasaki's father died about a year and a half ago, he felt untethered. Lacking any strong religious affiliation, Terasaki was unsure how to grieve. He craved a ritual or ceremony that would allow him to contemplate the death and to honor and give tribute to the father he revered. Terasaki's newest project, Feeding the Immortals, combines his search for a meaningful response to death with his artistic style of combining mixed-media work. This exhibition will include mixed media works with ceramic, photography, vapor projections (projecting images onto a thin layer of vapor) and video. When on a visit to his wife's parents in Japan, Terasaki noticed the family's ritual of kneeling before an altar in the tatami room and making a food offering. It made him think of other cultures and the use of vessels and food to commune with the departed. "I am not sure that I believe we can communicate with the dead, but ceremony allows for a gesture that demonstrates reverence," Terasaki said. "I don't believe we deal well with death in this modern culture. I think it's important for us to have some type of private ritual that gives us as individuals a way to remember and honor our loved ones." Bringing art with community involvement is part of Terasaki's artistry. For Feeding the Immortals, he held two “ceremonial” performances, the first presided by Kahuna Ka Uhi Keliʻiokalani Makua and the second by a Japanese Tea Master, Shigeki Itou. Family and friends were invited to bring a food reminiscent of a deceased loved one and to speak about them. A video of these cathartic “ceremonial” performances (with permission of the guests who attended) forms the inspiration behind Feeding the Immortals. The Ravizza Brownfield Gallery is pleased to announce our second exhibition, opening Tuesday, June 13, 2017, at 5 pm, titled “visual perception.” The show is part of the gallery’s international programming at the recently opened project space in the Arts District of Honolulu. We are pleased to present a group exhibition by groundbreaking international artists exploring light and space from the experimental era of the 1960s and 1970s through today. Artists included in the exhibition are Alberto Biasi, Hugo Demarco, Shay Frisch, Christian Megert, Francisco Sobrino and Nanda Vigo. Each of the exhibiting artists has been hailed internationally as a major proponent of well-known artistic movements including Kinetic Art, Optical Art, and the ZERO Group. Works by the artists are included in major public collections around the world, including the Museum of Modern Art, Centre Georges Pompidou, the Hermitage, and The Tate Gallery, among countless others. Curated by Alberto Podio of Italy, “visual perception” combines works that play with the viewers’ sense of space. The works, both individually and combined, create a new sensory experience, and blur the lines of what we perceive to be static and/or dynamic. From Biasi’s masterful use of PVC to create optical illusions from the 1960s to the contemporary work of Frisch, whose work explores electromagnetic fields using energy-conducting elements as his medium, the exhibition provides an exploratory snapshot of a highly experimental time in art history and a group of artists who have been willing to push the boundaries of the artistic process in order to express new ideas. 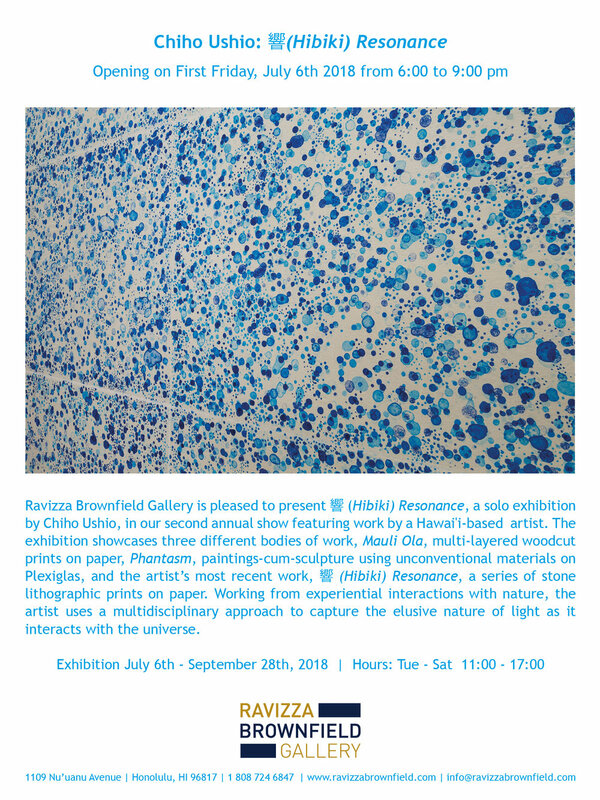 The Ravizza Brownfield Gallery is pleased to announce the opening of its new project space in a historic building in the center of Honolulu, Hawaii. The gallery, initiated by Allegra Ravizza and Shari Brownfield, aims to create a cultural presence to promote European art in Hawaii, as well as being a venue that cultivates an exchange of ideas to promote local creative research. The gallery intends to be a cultural crossroads where artists can be pioneers of a new world situated between America and Asia. We are pleased to present a solo exhibition by Michelangelo Pistoletto for our grand opening. The artist himself conceived various works specifically for the gallery, including an editioned project that pays homage to the tattoo culture of Hawaii. Combining a triad of works spanning much of Pistoletto’s remarkable career, Ravizza Brownfield Gallery, in collaboration with Galleria Continua (Italy, China, France, Cuba), will be exhibiting Senza titolo (Metamorfosi) (1976), Love Difference (2002), and Terzo Paradiso (2003). As with most works by Pistoletto, the artwork is not complete without the viewers’ direct engagement and relationship with the work. At the center of the gallery the site-specific installation Senza titolo (Metamorfosi), challenges the viewer to see beyond initial appearances through the artist’s iconic use of mirrors. Love Difference, a project Pistoletto initially conceived in 2002 to create interest in a peaceful dialogue between the countries of the Mediterranean, is specifically recreated for Ravizza Brownfield Gallery to incorporate the languages of the countries that overlook the Pacific Ocean. Terzo Paradiso, (Third Paradise), Pistoletto’s rearrangement of the mathematical sign for infinity, rounds out the exhibition. Represented by three contiguous circles, Pistoletto’s symbol will be created as a limited edition temporary tattoo which will be distributed both in Hawaii and Europe. Through this work the artist aims to create a new dialogue between the symbol/tattoo and the person bearing it, enjoining different cultures, tradition, and modernity, temporality and timelessness, nature and artifice.